Merkle Root A fingerprint for all the transactions in a block. A merkle root is created by hashing together pairs of TXIDs, which gives you a short yet unique fingerprint for all the transactions in a block. Why do we use a merkle root? You would need every other TXID to recreate the same hash. As a result, by using a merkle root as our fingerprint for the block header, we can later find out if a transaction exists in a block without having to know every other TXID in the block. A merkle tree is just an efficient way to prove that something is in a set, without having to know the full set. In this block of 28 transactions, instead of needing 27 other hashes, we only need 5 to prove that a TXID is used as part of the final hash. Let's say we have only have a block header for a block with 2,352 transactions, and we want to check that a specific TXID is inside the block. Without a merkle root (i.e. just a simple hash of all the txids in the block header), we would need to download 75,232 bytes (2,351 x 32 byte TXIDs) of data to recreate the fingerprint in the block header and verify that the TXID exists in the block. With a merkle root, we only need to download 384 bytes (12 x 32 byte branches along the path of the merkle tree) to recreate the merkle root and verify that the TXID exists in the block. 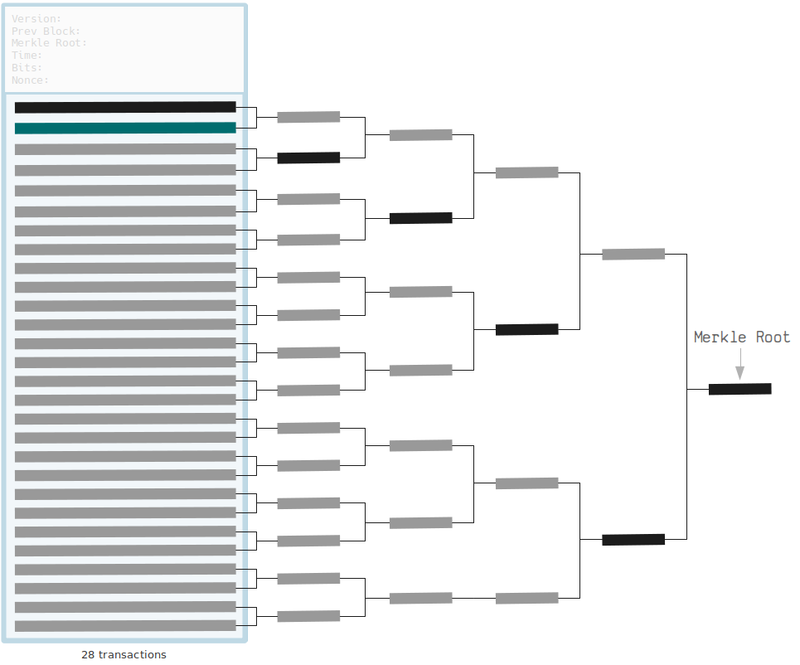 The merkle proof contains a list of the hashes along the branches of the merkle tree that we need to get to the merkle root. We just start with the TXID "leaf" we want to check, and recursively concatenate and hash through this merkle proof, which will give us the merkle root at the bottom. The branches of the merkle proof also need to let you know if they are on the "left" or "right", so you can concatenate each pair in the correct order before hashing them together. So whilst merkle trees take a little more effort in the beginning, they save energy when it comes to verification later on. When are merkle trees useful in bitcoin? Thanks to merkle trees, you can create "thin nodes" (or "lightweight wallets") that can verify when a transaction has made it in to a block, without the overhead of having to download and store the entire the blockchain. These wallets just download and store block headers, and use the merkle roots inside them (along with merkle proofs they receive from full nodes) to verify that a transaction has made it in to a block. Block headers are just 80 bytes, whereas each block can be 1,000,000+ bytes. How do you create a merkle root? And here's some Ruby code for creating a merkle root (from an array of TXIDs). It's worth a read, even if you're not a programmer at the moment. # Recursion: Exit Condition - Stop recursion when we have one final hash result. # Recursion: Do the same thing again for the array of hashed pairs. 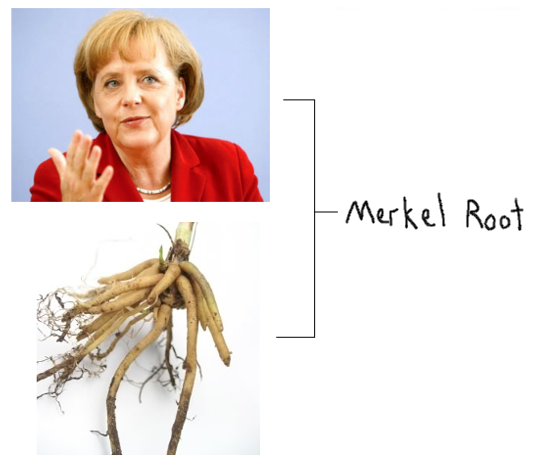 Why is it called a "merkle" root? Because Ralph Merkle patented it in 1979. 14 Feb 2019: Merkle Root - complete rewrite. Updated diagrams and included nice ruby code example.